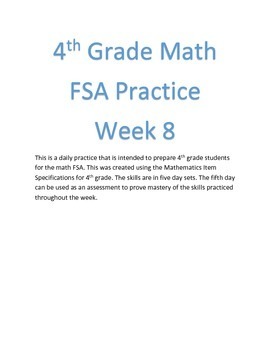 This is a daily math practice that was created using the FSA Math Item Specifications. Questions were created in the same format and style as the specifications so students can receive adequate practice with the language and wordage of the state assessment. This week's practice involves multi-select, and graphic responses. The skills are in five day sets. The fifth day can be used as an assessment to prove mastery of the skills practiced throughout the week. The standards practiced in this document are MAFS.4.NF.1.2 and MAFS.4.NB.2.3. This document includes 5 sheets.